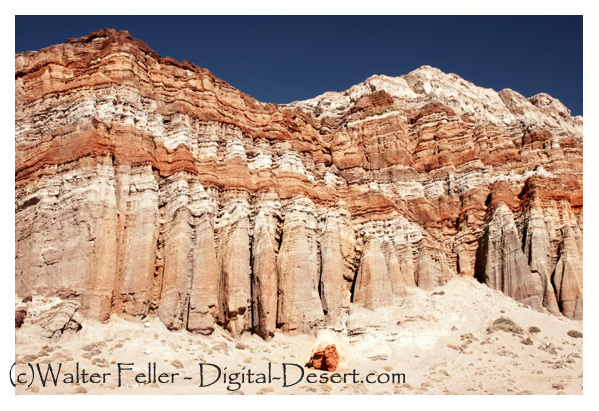 The geologic story of Red Rock Canyon is told by its unique rock formations. Layers of red and white sediments, creating the accordion-like folds in the cliff faces, are capped with a harder, more resistant black basaltic rock or pink volcanic tuff. These sedimentary and igneous layers were deposited in an ancient inland lake and valley millions of years ago and have subsequently been lifted by the Garlock, El Paso, and Sierra Frontal Faults. Streams and rivers have carved the canyon that we see today with its colorful cliff faces. The red coloring between the layers is an iron oxide (rust) staining.